Situated in North Derbyshire to the west of the city is the beautiful countryside of the Peak District. Here you will find glaciated valleys of limestone with geological features which follow this type of terrain such as caves which are open to the general public. Typical Peak District scenery may be found in the Hope Valley . Click here for our section on Castleton which is an amazing place for walkers, cavers, day trippers, explorers, gift shoppers or people who appreciate stunning scenery. Click here for our section on Bakewell - the home of Bakewell Pudding that you can taste and buy in the village. Check for forthcoming Farmer's Markets. Several villages in the Peak District hold Well-Dressing weeks. In these villages, the well is decorated with flowers and there is often a week-long series of events. Peak Shopping Village is the Peak District's first Factory outlet shopping centre. Here you can save money on a huge range of fashion, sportswear, home furnishings, footwear, luggage, pottery, cookware, toys and gifts. 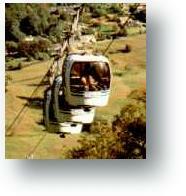 The villages of Matlock and Matlock Bath are very popular and cater for visitors with many attractions for all the family. Nearby is the Gullivers Kingdom Theme Park with a log flume, rides, chair lift, millennium maze, adventure playground and other attractions. More than 35 rides and attractions. Caters mainly for children aged 2-13. 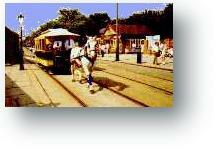 Near to Matlock is the village of Crich where you will find the Crich National Tramway Museum. The countryside of the Peak District is a very popular area, particularly at weekends being accessible from the high population conurbations of Sheffield, Derby, Nottingham and Manchester. Its countryside is ideal for walks of all categories of difficulty from a stroll up to genuinely testing climbs to various peaks in the area. Rock climbing may also be performed here. There are some ideal climbing locations including Froggatt Edge. The "Plague Village" of Eyam can be found in the Peak District. Visit here to learn how the villagers responded when the bubonic plague took hold. Click here for our Eyam Plague Village section. Also see Eyam Hall on our Eyam page. Check this site for more information on Guide to Towns & Villages of the Peak District. Attractions and accommodation in the Peak District - A guide to the main visitor attractions of the Peak District with the opportunity to find accommodation in the area. American Adventure - With over 100 rides and attractions, varied watering holes for the hungry and shops for souvenier hunter, there's plenty to amuse all the family. Open April to October. Bradwell in the Peak District - Community site for locals and visitors alike. Non-profit making and doesn't seek to promote any point of view or commercial enterprise. Buxton Online - Buxton community site promoting tourism, business and leisure. Discover Derbyshire and the Peak District - Enchanting villages, historic towns, glorious walks, heritage trails and beautiful pictures are featured in this new independent guide to Derbyshire and the Peak District. Eyam Hall - a 17th Century manor house, built and still occupied by the Wright family. A chance to experience 300 years of history through the eyes of one family. The farm units have been conveted into craft units. Ghost Planes of the Peak District - learn about genuine ghostly sightings over the moors. The National Tramway Museum - Situated in Crich, near Matlock. Voted Derbyshire family attraction of the year. Peak District Cottages - Bolehill Holiday Cottages in the Peak District (Bakewell 2 miles). A family run business offering self-catering holiday cottages in Derbyshire. Peak District Holiday Cottage - Two, two bedroomed holiday cottages appointed to a high standard with breathtaking views of the surrounding Peak District. Peak District Photos - Beautiful photos from around Derbyshire and the Peak District National Park by Richard Wheeler. Peak District View - Attractions and places to visit on your Peak District holiday. Peak District Walks and Walking Holidays UK - Walking, walks, walk routes and holidays in the Peak District UK. Peaktorial - Photography of Sheffield for sale for prints and stock. Peak Tourist Guide - guide to accommodation, food, drink & events in the Peak District. Peak Tours - Peak Tours arranges cycling & walking holidays & offers a cycle hire & delivery service in the Peak District. Peak District Online - Peak District Online is an extensive resource for information and details about all things concerning the Peak District! Peak Wreck Hunters - Looking for plane wrecks in the Peak District in and around Derbyshire? Look no further. Reliable GPS coordinates and open discussion from Mick and Sean.